The blueprint by Chennai-based WeBe Design Lab, keeping India Gate's Mughal architecture and central vista features in mind, was selected after a global competition. 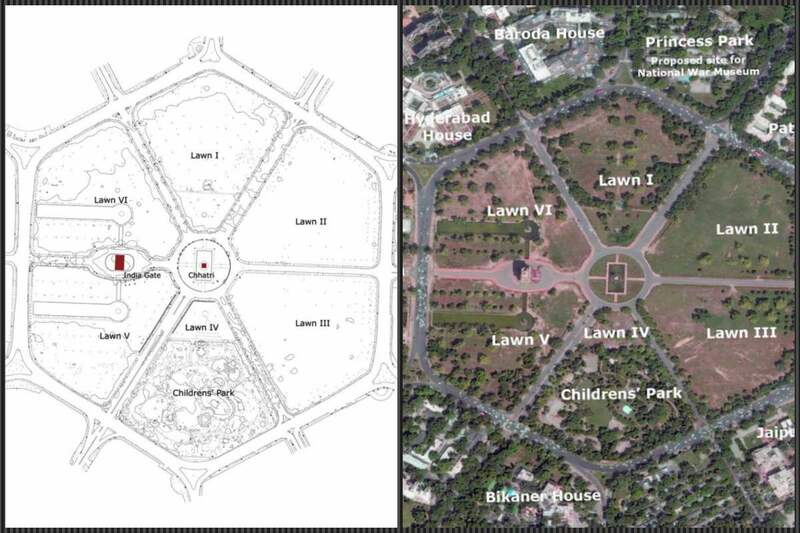 On the left, an image of the site shared by the Ministry of Defence for the global design competition, and on the right, a picture of excavation work at the India Gate site, as shared by the winning team's Facebook page. The image has since been removed by the architectural team. New Delhi: Almost six decades after it was first envisaged, a new memorial to soldiers who laid down their lives for the country is quietly taking shape in Lutyens’ Delhi, behind nearly five-metre-high screens which cover two of the grounds in the C-Hexagon around India Gate. The new memorial would come in the axis of India Gate and the canopy, or chhatri, and Delhi’s architects and conservationsists are hoping the design – which the government is keeping tightly under wraps – will be in keeping with the concept of the central vista and not mar the historically important architectural aesthetics of one of the most iconic locations in the capital. In keeping with the broad requirement of preserving the visual integrity of the hexagon, the winning design is likely to be sunken, which would explain why a lot of dug up earth can been seen around the site. A tunnel is also likely to be constructed at a later stage from the memorial to the proposed National War Museum – due to come up at Princess Park off the India Gate roundabout by July 31, 2020. While the plans for the memorial, which is expected to be completed ahead of Independence Day this year, have been cleared by the Delhi Urban Arts Commission, the Heritage Conservation Committee and the Central Vista Committee, the plans for the museum have not been approved so far. The result of the global design competition was announced in early April 2017 and while Mumbai-based sP+a Studio’s proposal was adjudged the winning design for the war museum, the Chennai-based WeBe Design Lab’s proposal was declared the winner for the memorial. However, rather than revealing the designs, the government has chosen to keep them a secret and even the approval agencies and designers were told not to share them. The website of WeBe Design Lab too does not provide any details of the winning design. The designers had on their Facebook page, however, shared a picture of excavation work at the site, which they removed shortly after The Wire’s story first appeared. Talking to The Wire, Vinod Kumar, member-secretary of the Heritage Conservation Committee set up by the urban development ministry said there were two elements to the design of the National War Memorial and Museum. “While the memorial design has been cleared, some aspects of the museum design are being reviewed.” The HCC was set up in 1983 for the protection of heritage buildings, precincts and natural feature areas in Delhi. The MoD specified six design guidelines for the proposed memorial. First, that the design “respect the sanctity of the Central Vista and India Gate as national assets, and as a major open space for Delhi.” Second, it said the design “should pay more attention to landscape based interventions rather than any major construction except for commemorative wall, platforms and minimal public utilities”. Third, the planned memorial “should not disturb the existing layout of Rajpath and its monuments.” Fourth, that the memorial provide unhindered access to the public. “It should have space for people who would like to spend some time peacefully to pay their respect and honour the memory of the soldiers,” the proposal noted. Fifth. the height of any built component of the Memorial should be below the human eye level”, and not be more than 1.5m. corresponding to road level. Finally, the memorial “should be planned to suitably connect the two lawns (II and III) and across with the proposed War Museum (Princess Park). Though the demand for a national war memorial to honour soldiers killed in independent India had been raised in the past too by the defence ministry, it was only in 2006 that it put forth a formal proposal. The ministry suggested that the memorial be built behind the canopy or chhatri (which once housed a statue of King George V but has been unoccupied for decades – and a lawn be created on a raised platform as high as the canopy’s plinth. Further it had demanded that the inside wall of the memorial be inscribed with the names of all the soldiers who died fighting after 1947. 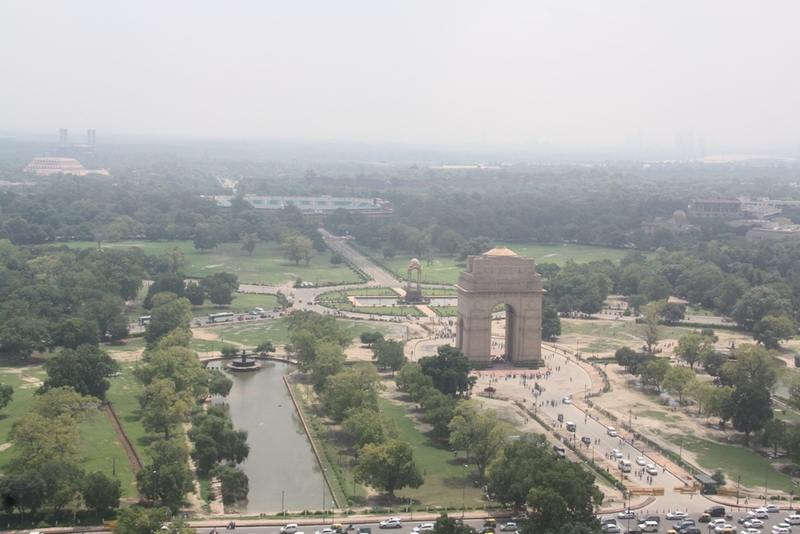 But the Heritage Conservation Committee and the Central Vista Committee had objected to the plan, saying it would obstruct the view of India Gate. Indeed, proposals were made by architects and conservationists at the time that the memorial come up on defence land elsewhere, so that the architectural sanctity of the central vista was not disturbed. However, the plan was not shelved and the ministry kept raising the demand. Though during UPA rule defence minister A.K. Antony also supported the move, the plans did not fructify. In February 2014, ahead of the Lok Sabha elections, Modi, who was then the BJP’s prime ministerial candidate, spoke about successive governments having failed the soldiers by not building a national war memorial. “There is no country in the world where there is not a war memorial. India has fought several wars, thousands of our soldiers have been martyred, but there is no memorial to honour their sacrifice,” he had said at an event organised in Mumbai to mark the 51st anniversary of the famous song ‘Aye mere watan ke logon’, sung by Lata Mangeshkar. This is one of the reasons why his government has been rushing to complete the memorial during its term, which comes to an end in 2019, since it does not want the absence of a memorial to backfire. As a first step, on October 7, 2015 the Union cabinet cleared a Rs 500 crore budget for the National War Museum and Memorial. A statement issued by the Centre said the memorial would be constructed “in memory of all Indian soldiers who have made the supreme sacrifice for the country post-independence”. The decision had also come in the wake of the Modi government inviting the ire of defence personnel due to its inability to deliver on the OROP (one rank one pension) promise in full. The government statement had also noted that “the memorial will promote a sense of patriotism in the minds of visitors, and will award an opportunity (sic) to citizens of this vast nation, to express their token sense of gratitude to the brave soldiers, who laid down their lives for the mother land.” As for the museum, it was stated that it would capture “poignant moments in history” pertaining to the sacrifice of soldiers. The memorial would need to solemnly showcase number, rank, name and unit of approximately twenty five thousand martyrs on a commemorative wall with scope for future requirements. Another crucial feature of the memorial would be a tunnel that will connect it to the proposed National War Museum that will come up at Princess Park, since that is the only way to ensure unhindered access from one to the other. The tunnel work will not be completed ahead of the memorial launch as the work on the Museum, which is due to be completed by July 31, 2020 has got stalled as the DUAC has not approved of its design. 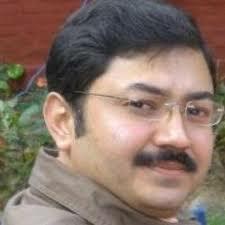 Noted photographer Ram Rahman described the move to create the National War Memorial in between the chhatri at India Gate and the National Stadium as “a part of the jingoist thrust of the Modi government which thinks by making memorials like this it will be able to garner votes”. Note: In an earlier version of this story, images from the design which actually came third were presented as the winning design. In fact, two designs submitted by teams within the same firm, WeBe, came first and third and images from the latter were posted online by a former employee as the “winning” entry. The Wire apologises to its readers for the error, and will provide images of the winning design as soon as they become available.